Photo courtesy of Iain Inglis. Sign found in Wuhan, China. The power of the Parks Committee compels you! What?! Without a hazmat suit?! No wonder he’s missing hands and feet. oh no! inprision all the evil rubbish before it conquers the world!!!!! I guess now we know where we can get rid of all the Obama ’08 signs when the election is over. 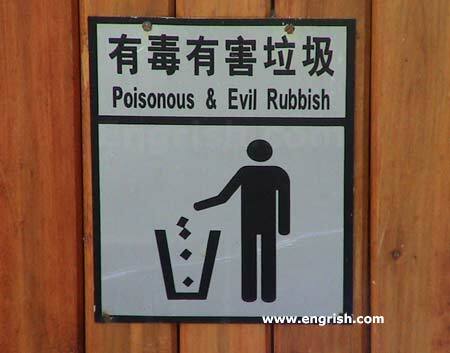 Harmless and Benevolent Rubbish must be deposited elsewhere. Ideal for grandma underwear disposal. From hell’s recycling bin, I sneer at thee! Is that my comic book collection? Where does the pure and holy rubbish go? If I was you, I would restrain from throwing garbage to that garbage bin! I’ve heard bin Laden conspired with the evil rubbish to make the entire landfill an undesirable place to be in! Clean people everywhere, we must be vigilant! what about nice and harmles rubish? the raign of the evil (rubish) shal end! halleluyah! We ran out of biohazard signs…so this will have to do. @Bridget-There are a lot of liberals nowadays who WOULD like to place their Obama sign in there! lol damn you, evil rubbish!!! Oh, Jove! What excessive use of pathetic fallacy. ‘Tis un peux wearisome, is it not? Begone foul rubbish! In Jesus’ name, I banish thee back to the depths of hell!